Firstly, can I ask: do you like the new comment area using Disqus? If not, I can have it removed —> Is it making it more difficult to leave comments? Today, I decided to do my first Kettlebell workout in over 2 weeks! There are times I like to change things up, so this last while I decided to start walking EVERYWHERE. Last week, I walked a total of about 30 miles. This week will be over 20 🙂 When the weather is clear and dry, I just love walking in the crisp air. Over the next while, I plan to do 2-3 gym workouts, 1 KB workout and a LOT of walking. Keep things fresh! The workout ended up being quite a long one in comparison to the usual – however it was fun and challenging, so I hardly saw the time go in. 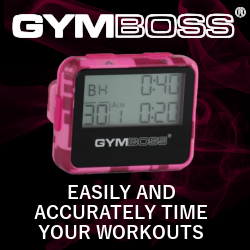 Set your Gymboss Interval Timer for 10 cycles of 20 seconds rest and 40 seconds effort. Complete 3 rounds in total of the 10 exercises and complete one set of the “Bridging Combination” after rounds 1 and 2. Push Press (right) (14kg then 16kg) (15, 10, 9) 16kg was tough! Hope you enjoy it too! Please let me know about the Comment section –> vote yes or no for the new set-up! PS – Check out this link for novelty Fitness Jewelry – they even have mini Kettlebell Necklaces! !